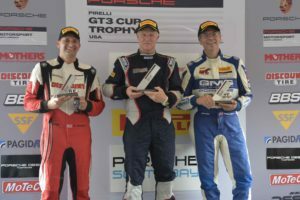 Tooele, Utah – McKay Snow emerged from a close battle with Pirelli GT3 Cup Trophy USA championship leader Loren Beggs (No. 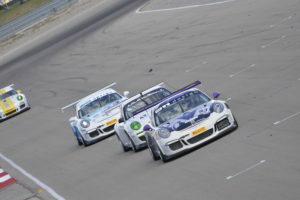 08 911 Design/Porsche GT3 Cup) to claim his second win of the weekend at Utah Motorsports Campus on Sunday for TruSpeed Autosport. The second round of the double-header race weekend opened with an early yellow flag for a start line tangle, with the race then running the final 35 minutes at a flat out pace under green flag conditions. A late race spin for Beggs as he navigated lapped traffic saw Snow joined on the podium by a hard charging Max Root (No. 07 GT Technik/Porsche 911 GT3 Cup) and Russell Ward (No. 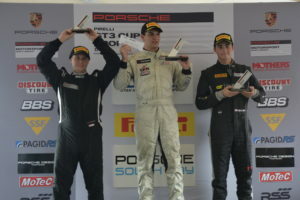 35 WinWard Racing/Porsche GT3 Cup) as a trio of young upcoming racers swept the podium. After suffering the disappointment of a first-lap incident that ended his day early on Saturday, Bryce Ward made an emphatic rebound on Sunday to score a Diamond Masters class victory in the No. 57 WinWard Racing Porsche GT3 Cup. Ward was joined on the podium by Preston Calvert (No. 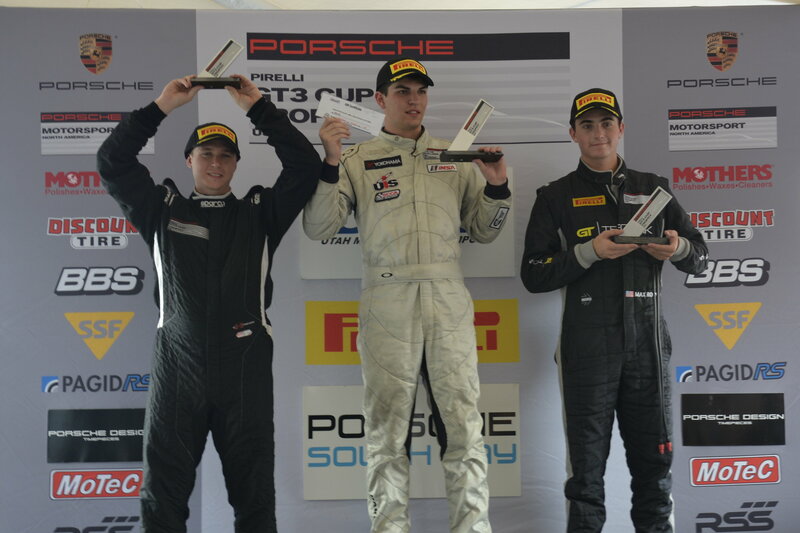 71 Calvert Dynamics/Porsche GT3 Cup) in second and Saturday’s race winner Michael Zuieback (No. 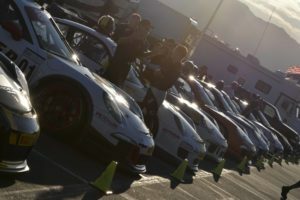 2 Competition Motorsports/Discount Tire Porsche 911 GT3) scoring third. The season-long Silver class battle that has seen Jeff Kearl (No. 26 Rearden Racing/Porsche Cayman GT4) and Sean McAlister (No. 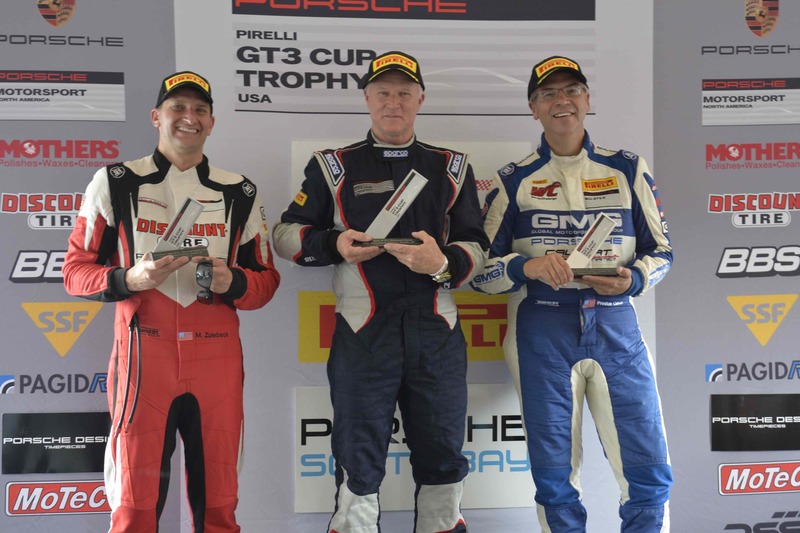 00 Competition Motorsports/Porsche Cayman GT4) trading turns at the top saw Kearl use his home track advantage to sweep the weekend with two victories. McAlister finished second, with series newcomer Tim James coming all the way from New Zealand to score his first-ever series podium. The Platinum battle closed with Ray Shahi (No. 65 Newport Beach Sterling Porsche/TruSpeed Autosport) taking the checkered flag ahead of his TruSpeed Autosport teammate Larry Schnur, with Air Power Racing’s David Lockwood coming in third to replicate the podium celebrants from the Saturday outing. Similarly, it was deja vu for the Silver Masters podium as Steve Goldman (No. 1 Competition Motorsports/Porsche Cayman GT4) bested Carl Tofflemire (No. 62 Competition Motorsports/Porsche Cayman GT4) for the victory, while the No. 59 Flying Lizard Porsche Cayman GT4 of Martin Brauns took an encore third place finish. Pirelli GT3 Cup Trophy USA would like to acknowledge and thank Rafael Navarro, who has long steered the motorsports operations for Pirelli. Navarro will retire from his duties at the end of the month after building and supporting a range of motorsports properties in North America. Pirelli GT3 Cup Trophy USA will next head to the Circuit of the Americas as part of the Pirelli World Challenge race visit to the Austin facility on Labor Day weekend. This entry was posted in News on August 13, 2017 by admin.